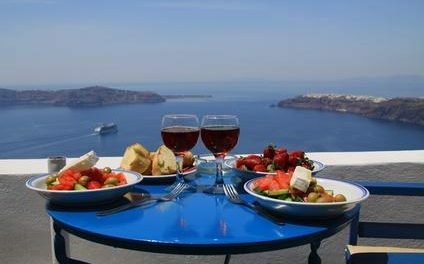 You will not have trouble finding a place to eat on the island of Santorini; there are so many restaurants and tavernas in the island, that you can choose to dine in a romantic terrace overlooking the caldera, or in a typical restaurant to enjoy the flavours of Greek cuisine. 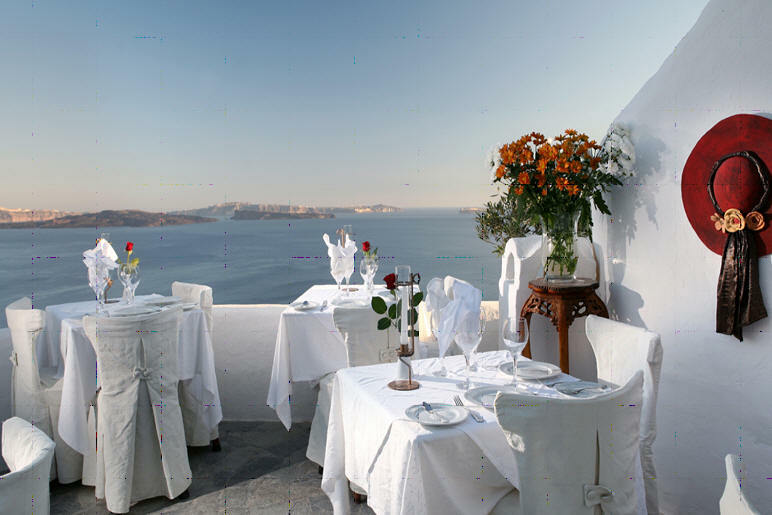 Ideal for a romantic evening, refined and elegant, the restaurant offers good food (the chef is Italian) and a spectacular view of the caldera. Another great place that offers a breathtaking view of the caldera (top photo); the kitchen serves classic Greek dishes accompanied by a good selection of wines produced in Greece. Prices are a bit expensive but if you feel like an exclusive romantic dinner by candlelight this is the right place for you. A typical restaurant located in Fira in the city center, the friendly waiter who speaks fluently several languages is nice, the food is good and the prices are not high. Recommended for a quiet evening. Typical tavern located in the square of the small village of Megalochori, the atmosphere is very charming, the restaurant offers cuisine prepared with the main dishes of the Greek tradition. Good selection of wines and desserts all homemade. Prices are not low but it is really worth dining at least once in this lovely restaurant. The Raki is a great restaurant just a short walk from the villas of Megalochori, in the square where you will also find 3 or 4 taverns all of quality. The Raki is one of them, an elegant place, which in addition to traditional cuisine offers a great variety of seafood dishes. Located in the traditional village of Karterados in just 1km from central Fira, Skaramagas, is without doubt one of the best tavernas on the island that offers seafood specialties. Managed directly by fishermen who always offer you the catch of the day, The service is flawless. The seats are arranged partly inside and partly outside under an arbor. Average prices contained.